Last month saw the most gun-related background checks run by the Federal Bureau of Investigation of any March on record, documents released by the agency on Tuesday show. With 2,767,699 checks conducted by the FBI's National Instant Criminal Background Check System (NICS) in March 2018, the month beats the previous record of 2,523,265 set in March 2016 by 244,434 checks. That represents a 9.68 percent increase. The March results put 2018 on pace to see more gun-related background checks than 2017, the second-best year on record, but still behind 2016, the best year on record. The number of checks run through NICS in a month is considered one of the strongest indicators for how well gun sales are doing because each sale made by a federally licensed dealer, such as a gun store, is subject to a check. The state, however, is not an exact representation of gun sales due to a number of factors. For instance, the vast majority of states don't require checks on the sale of used guns between private parties, some states use the checks in their process for issuing gun-carry permits, and sales of multiple guns during a single transaction by a dealer generally only requires a single background check. "These statistics represent the number of firearm background checks initiated through the NICS," the FBI wrote in its report on the number of checks. "They do not represent the number of firearms sold. Based on varying state laws and purchase scenarios, a one-to-one correlation cannot be made between a firearm background check and a firearm sale." The spike in background checks comes as gun-control activists made their most publicized and successful push for new gun-control laws in years. In the wake of the shooting at a high school in Parkland, Fla., gun-control activists have organized highly publicized national protests calling for new bans on the AR-15 and other firearms and accessories at both the federal and state level. They have also successfully instituted strict new gun-control measures, like a ban on gun ownership for adults under 21 and new waiting periods on all gun purchases in Florida while advocating for their passage in other states as well. Gun sales in the United States have traditionally spiked in the wake of violent attacks and the subsequent pushes for new gun-control measures. 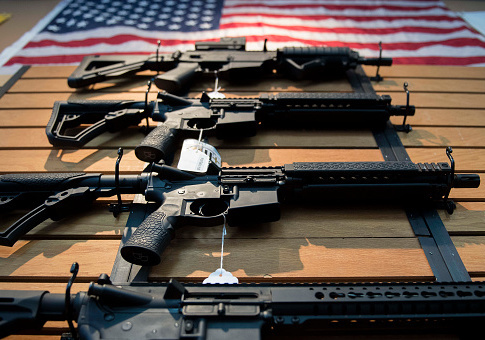 "Sales of semi-auto rifles, especially AR and AK platforms, have more than doubled in sales since the Florida shooting and subsequent media coverage of possible pending legislation," Rex McClanahan, owner of one of the biggest online gun dealers, Bud's Gun Shop, told the Washington Free Beacon at the end of February. "This is exactly what happened after Sandy Hook, San Bernardino, Orlando, etc." He said the push to buy certain guns, especially those targeted by gun-control activists, nearly depleted his inventory. "The market on these types of guns had actually gotten very soft after Trump took office," he said. "Manufactures and distributors alike were sitting on thousands of them and the prices had dropped substantially. That inventory has now almost completely cleared out since the school shooting in Florida."